Available in 0-3, 3-6 & 6-12 Months. Baby girls ivory long gown with matching bonnet, perfect for your baby girls christening baptism day. 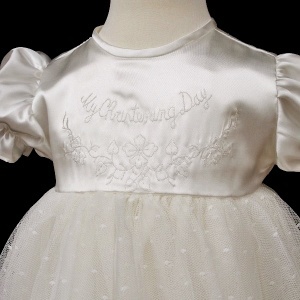 Gown: This pure ivory gown has a satin bodice which is embroidered with 'My Christening Day' on the front. A satin sash beautifully ties around the back into a bow. This gown has short puff elasticated sleeves with a discreet zip fastening at the back. Triple-layered overskirts for fullness - two layers of large fluttered net tulle with polka dots all over with a satin underlay. 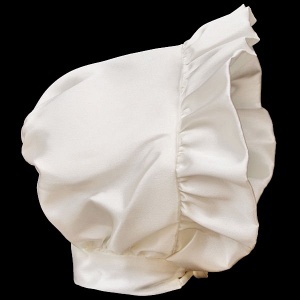 Bonnet: This satin bonnet is stunning. Matching to the gown, it has a frilly peak with a satin bow at the front, completing this elegant design. Brand new with hanger and a clear protective bag to keep the gown & bonnet in perfect condition. 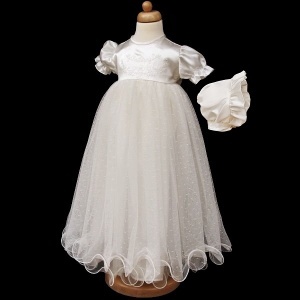 This designer christening gown is made in England UK. The quality is outstanding and is made with the finest materials. This christening baptism gown will make a perfect precious family heirloom for future generations of your family. 0-3 Months 27" 24" 18"
3-6 Months 29" 25" 19"
6-12 Months 30" 26" 20"